Analysts and military experts believe that last year was especially symbolic for Russia’s armed forces development because of the decisions made on military equipment, the return of military property sold illegally, improvement of troop training quality and development of military science and education. It has been one year since the appointment of Sergey Shoigu as Russia’s Minister of Defense, and by all accounts, he has been making swift improvements in the Russian armed forces’ procedures and policies. President Vladimir Putin removed Anatoliy Serdyukov as Minister of Defense and replaced him with Shoigu in November 2012. The most popular and recognizable Minister in Russia (based on survey results), Shoigu was assigned to the post after serving for a short while as acting governor of Moscow Region. Before that he had been the head of the Ministry of Emergency Situations for many years. Shoigu was assigned to his new position against a background of the reverberating scandal surrounding the company Oboronservice. 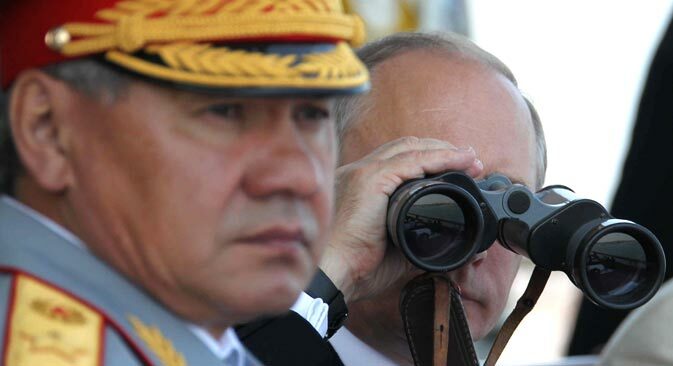 The key players in this scandal were persons close to the former defense minister, and one of the first decisions Shoigu faced after taking up the post was to recover property sites, previously sold in breach of the law, back to the Ministry of Defense. “The initiatives of the heads of the Ministry of Defense regarding de-commercialization of the army are, first and foremost, targeted against corruption,” said Pavel Verkhnyatskiy, the lead analyst of the Political Information Center. Shoigu is also credited with the introduction of a system of total vital cycle contracts for the purchase of weapons and military equipment. This system implies that the enterprise that has sold a certain item to the armed forces will render continuous support to such a project, from the beginning of construction until disposal. In accordance with the department’s plans, practically all enterprises of the military must provide a total vital cycle of manufactured weapons and military equipment over the next two to three years. With the arrival of Shoigu to the post of Minister of Defense, the department has reinstated the practice of regular inspections of the Russian Army. These inspections help to evaluate objectively the level of military readiness of the armed forces and to set out the best ways to address current problems. The first unannounced inspection in the last 20 years was conducted at the central military district midway through February this year, which was followed by a number of other, similar events of various levels took place in other military districts. Experts said that the unannounced inspections of the Russian Army help not only to understand the actual military readiness of the Armed Forces and to test the close cooperation between all their elements, but in addition, they teach the military service personnel of all levels the ability to react instantly to any potential threat. “The cornerstone of the armed forces is their readiness to enter battle at any moment. More has been done over the last year in this respect than in the preceding decades,” said Victor Zavarzin, first deputy head of the State Duma Defense Committee. Based on materials from Gazeta.ru, RIA Novosti and Vzglyad.